This year was the first year of the inter7s.com ‘Iberian Cup’. Thanks to the efforts of DB Sports Tours, we brought our best 1st division team, Tribesmen, and our best 2nd division team ‘All Sorts’ to Salou for a trip of a lifetime. For four days we stayed at the fantastic Cambrils Resort. During the trip we were involved in a mini-tournament at Futbol Salou, and also tickets to go to a Barcelona match and visit the famous Camp Nou stadium. The 22 players arrived at SalouAirport to a comfortable 26 degrees, which compared to a cold and rainy Dublin was paradise! Quickly we were escorted by bus to the resort which set the tone for the trip. The resort was just 10 minutes away from the airport and consisted of five beautiful cottages, equipped with all that you’d ever need. All the essential amenities were there; including kitchen, TV, barbeque and not to forget a personalised bottle of Cava in the fridge. While it was at the end of season all sports facilities including an indoor and one outdoor pool was open, with an on site supermarket that the lads quickly raided and let the party start. The party was rudely interrupted by our tournament! Essentially we were taking part in a mini-tournament situated in Futbol Salou – 10 minute jog away. Within the tournament our two teams would face a side of local ex-professionals, and also a side which we put together from both travelling teams, known as Inter7s All Men. An excellent 2 hour tournament began, at an excellent venue. With balls, floodlights, refs the craic all supplied in bucket-loads. The local side, Salou Sevens, just pipped the 7s All Men to the title of ‘Iberian Cup Holders’. The locals, who were deserving of the win, took the trophy and pride for their area.. Then the party started! The lads had three days of partying in Cambrills and Salou, and took the trip up to Barcelona to party in the city, starting with a Barcelona match, provided by DB Sports, with tickets 12 rows back from front! We were so close it seemed like you could smell the players. After the game we went straight out after to the local bars and tapas, partying until nine in the morning. 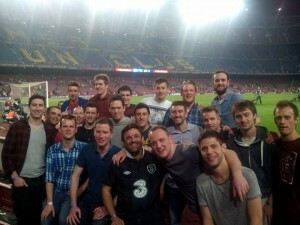 Despite the hangovers we then made it to the stadium tour to get a behind the scenes look at the famous CampNou stadium. Finally, the lads jumped on the train back to Salou, where they finished the party closer to the resort. Monday morning arrived far quicker than we’d have liked. Soon it was back to reality and the lads were back on the flight home to play again in their own leagues that night, with only great words to say about the trip. As a tester for our club, it has left us in a position to certainly want to return next year, and improve on what was already a great weekend for all. Who knows, it may be four Irish and four local teams next year.